First edition in Latin and German and the first edition of the German text. With: Speculum sancte Marie v(ir)ginis. In Latin and German with a metrical summary by Frater Johannes of the Monastery of SS. Ulrich and Afra. 305 x 215 mm. – 270 leaves. With 192 (15 repeated) woodcuts by the Bämler-Master. Although each of the chapters of the Speculum was meant to serve as inspiration for a sermon, the book itself functioned as a preacher that combined text and image to bring the message of Christ's life to both the learned and the illiterate. The current edition was printed in the Benedictine monastery of SS. Ulrich and Afra in Augsburg. 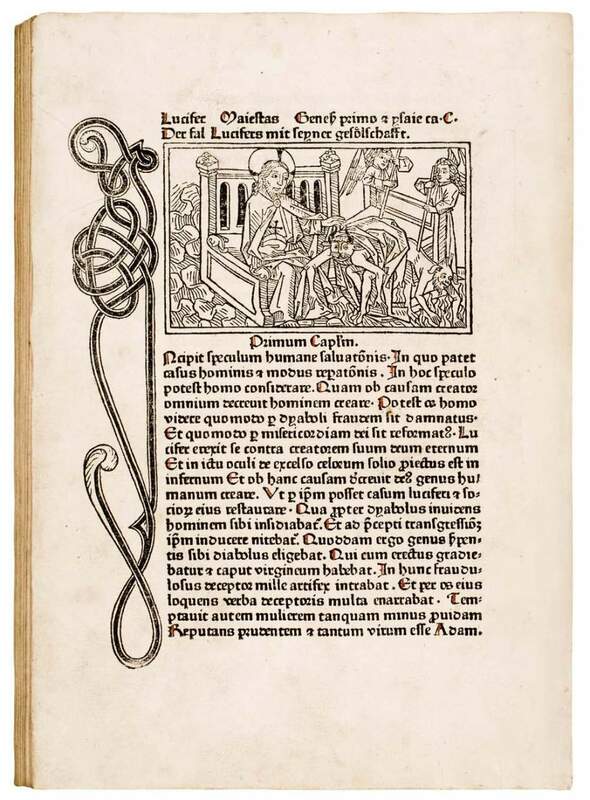 Its abbot, Melchior von Stammhaim installed a complete printing shop in 1472 by purchasing five presses from a defunct local printer and borrowing types (and perhaps also craftsmen and technical expertise) from Günther Zainer, Johann Bämler and Anton Sorg. The press did not continue long after the abbot's death in 1474. The illustration of the present book – with 192 woodcuts used here for the first time – constitutes one of the finest examples of striking a perfect balance between type and image: the strong, simple Gothic type harmonized well with the bold, clear lines contouring the figures.